Beautiful. Wplus9 hits a home run with every release. The lattice die is so unique. If only my craft budget were bigger. I really love that lattice die and those beautiful flowers. Great cards, Mo! These are gorgeous. I especially love the first one. These are so pretty, Maureen! 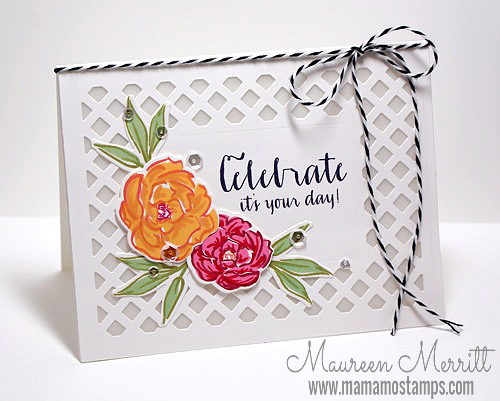 Love the lattice die and the flowers are just lovely. Your cards are super pretty and love the colors you chose. A duo of incredible delight here! Soooo beautiful! Absolutely love the flower/lattice frame combo! Beautiful! I especially love the first. You're right: the lattice frame is perfect with the peonies. Simply adore seeing those peonies! Love the clean lines and cheerful colors! Thanks for sharing!